I have become such a bad blogger lately. Maybe I will just call it "taking a break" during the summer. Well now that school is back in session, summer is technically over and therefore the excuses are over. Right?! Since school is back in session, the Cricut Blog has been focusing on school themed projects all during the month of August. I had an assignment that went up last week to use office or school supplies on a layout. 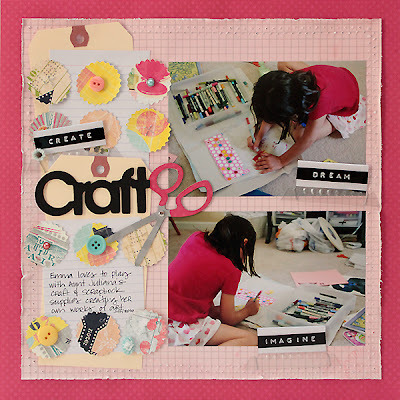 It was a fun challenge for me and I really enjoyed playing with something that was not just made for scrapbooking. The photos I scrapped are of my niece (who started Kindergarten yesterday and LOVED it!!!) playing with my scrapbook supplies to create her own little works of art! She always has a blast doing this, and I really wish I lived closer sometimes so that I could have her over more often to do this. The office/school supplies that I used on my layout included: manilla tags, index cards, tabs from hanging file folders, Dymo label maker, and staples. I used one of the index cards as my journaling box. 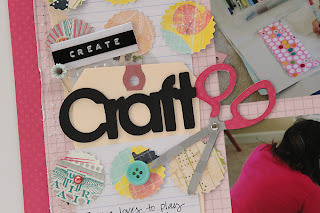 If you are interested in my school related projects and ideas, make sure you stop by the Cricut Blog and check out the past posts and the upcoming posts for August. Thanks for stopping by as always! And by the way...how much is enough or not enough when it comes to blogging? Any thoughts? What an adorable page - isn't it fun when the kids join in!